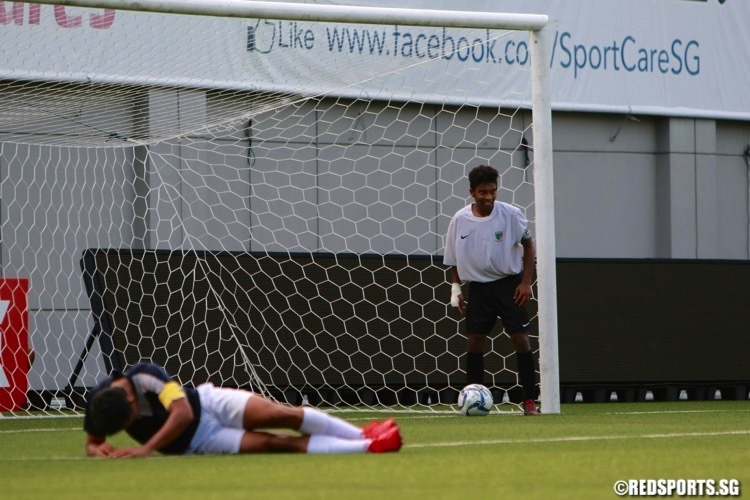 Jalan Besar Stadium, Wednesday, July 27, 2016 — The seconds were ticking down in extra time on an already astonishing playoff for third place in the National B Division Football Championship. With 10 minutes left, Siglap Secondary had come back from 1-3 down against St. Gabriel’s Secondary to make it 3-3 and force extra time. In the extra 10 minutes, a staggered St. Gabriel’s had no answer as Siglap put two more past the bewildered Marc van Huizen (#1) in goal. With four straight goals, the bronze medals, which looked destined for St. Gabriel’s just 20 minutes earlier, were heading into the Siglap bag. Then came another chance for Muhammad Shahrul Shah (#12) of Siglap who had already completed his hat-trick. Shahrul, smaller and shorter than all the St. Gabriel’s defenders, had tormented them the whole afternoon with his speed and control. If you ask his opponents this year, they will probably confirm that defending Shahrul is like trying to catch the wind. It seemed there was enough time yet for the Siglap captain to punish St. Gabriel’s again. Left one on one with the goalkeeper after a through ball, Shahrul easily rounded van Huizen inside the penalty box. However, instead of blasting into an undefended goal to cap off a remarkable comeback, Shahrul stopped the ball dead on the goal line. He turned to face the chasing St. Gabriel’s defenders, who were running back more out of reflex than in any real hope of stopping him. Central defender Hanafi (#15), the St. Gabriel’s captain, did not even reach Shahrul – he collapsed to the ground with an injury. Shahrul waited for what seemed an age as the spectators and the benches looked on. Was he going to back-heel the ball in? Was he going to torment a defender by waiting for him to cover the last 10 metres before scoring? What was Shahrul going to do? Then, just as Riyadthuddin (#17) of St. Gabriel’s was about to reach him, Shahrul put the ball out for a goal kick. As the striker ran back towards the centre circle, he saluted his bench with a somewhat apologetic and sheepish smile, and acknowledged the spectators’ applause. At that point, Shahrul would not know if his sportsmanship would cost him the top scorer award as the final between Tanjong Katong and Hong Kah Secondary had yet to be played. After Tanjong Katong won the final 1-0, the 16 goals he scored was enough for Shahrul to win the award. “Shah showed the heart of a sportsman by opting to kick the ball out of play to allow an opponent on the ground to receive medical aid, instead of into an open goal and put himself in contention for the Top Scorer Award,” said Mohd Azman, the vice-principal of Siglap Secondary. The third-place finish caps off what is Siglap’s final year before it is merged with Coral Secondary next year. A merging of schools will bring a sense of loss, but when Siglap old boys and girls tell stories of what makes their school special in the years ahead, the story of captain Shahrul Shah’s sportsmanship will be one of them. Please let us know the names of the scorers in the comments section and we’ll update the post. Thanks.